Pinith & Harshani got married in a very exciting & unique way yesterday 4th March 2013. 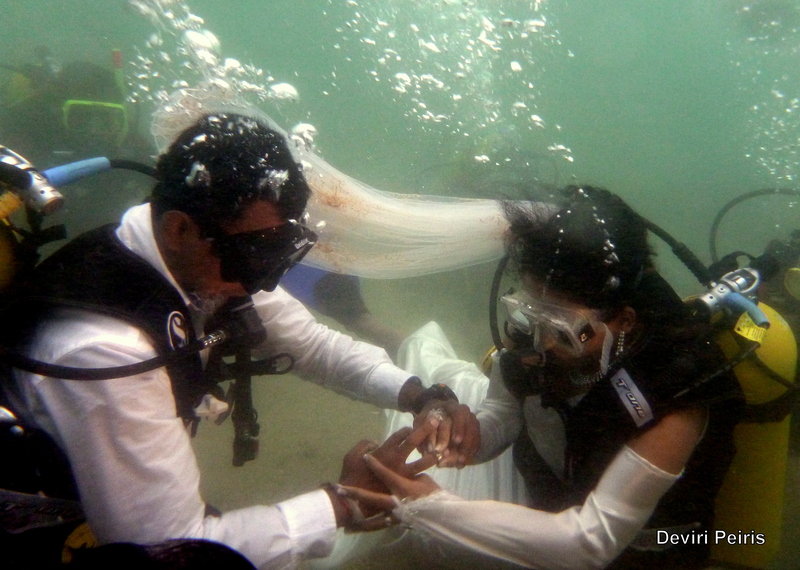 Having learnt Scuba Diving from PADI Instructors Dr. Ranjith De Silva & Devsiri Peiris as well as PADI Dive Master Yohan Abeysekara they decided to take a dive into their new life ahead as husband & wife. The Dive site was inside the Marine national park at Hikkaduwa, Sri Lanka. Fortunately close friends & the bridal party all were PADI certified open water scuba divers & were able to witness & be a part of this special event, while the many other friends & family members were able to enjoy the underwater videos & pictures during the dry ceremony. The whole idea & pre arrangements were inspired by the couple themselves including the unique invitation in a bottle. The dive site preparation & cordination was done by PADI instructors Chami & Lal & underwater video & photography done by PADI instructors Menaka & Devsiri. While PADI instructor Dr, Ranjith De silva & PADI Dive Master Yohan Abeysekara ensured the safety of all the divers.